← How to share document from Android device to social network for example Twitter? Question: I want to develop an android application that receives documents from other apps, converts them to PDF, and sends the PDF to an online API.My question is: How do I show my app in the list of "share to" applications that are available to most Android Apps? Is there an online tutorial somewhere? e.g. if you click "share to" on an image, various apps show up (messages, Gmail, email, etc) - how do I add my app to this list? Is there a solution on VeryPDF? Answer: When you need to develop Android share to function application, maybe you can have a free trial of VeryPDF ShareFile first. This cloud based application can help you share file in Android system. It can help you receive documents from other applications, convert most of the common files to PDF. And you can either download converted PDF file to uploaded source file. You can share file directly from social network like Gmail, Facebook and others. If you feel this application mode is good,please contact us then we can customize one application for you or send the source code of developing to software to you. Please check more information of this software on homepage, in the following part, I will show you some of functions of this application. API for receiving documents from other APP or users. When uploading file to this cloud based application then other users can download the uploaded file directly. Simply input the Share ID, then the users can find all the uploaded file. Please check details from the following snapshot. Click button View then you can view and download the uploaded file directly. Only the users share their files to this website, then you can view and receive uploaded file from this website directly. This cloud based application nearly supports all the formats of files no matter Office document or photo image, you can receive documents by this method. Android share to function application. Now let us check the “share to” function. Same with the first function, you need to upload files first. This API allows you to upload files in batch. When uploading finishes, there are some options below it, like View, Share Online, Edit Online, and Annotation Online. Please click button Share Online then you will enter its share to function part. The following snapshot is from the share to function, please have a check. Convert uploaded file to PDF. By this cloud based application, you can also convert uploaded files to PDF. 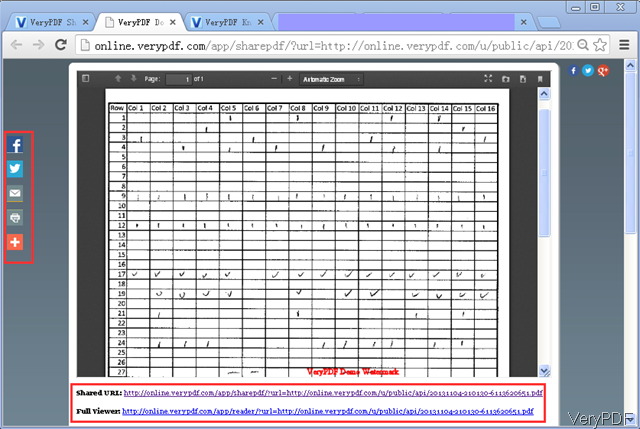 Checking from the above snapshot, we can get and URL of PDF file. By the link, you can download the uploaded file in the format of PDF. When you need to download the source format uploaded file, please click button View. By this mode of cloud API, you can convert files to PDF, share files and receive documents from other application. If you need to develop such one, please contact us then we will make for you at once. How to convert RTF to PDF without losing layout? How to downsample images within PDF file under Linux? How to edit ellipse comment in docPrint preview application? 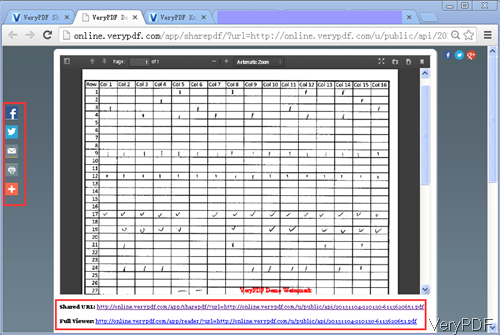 How to edit a scanned PDF for posting information free online? How to play a PDF like flash? How to repair password protected PDF file by cloud API? This entry was posted in VeryPDF Cloud API and tagged Android share to function. Bookmark the permalink.